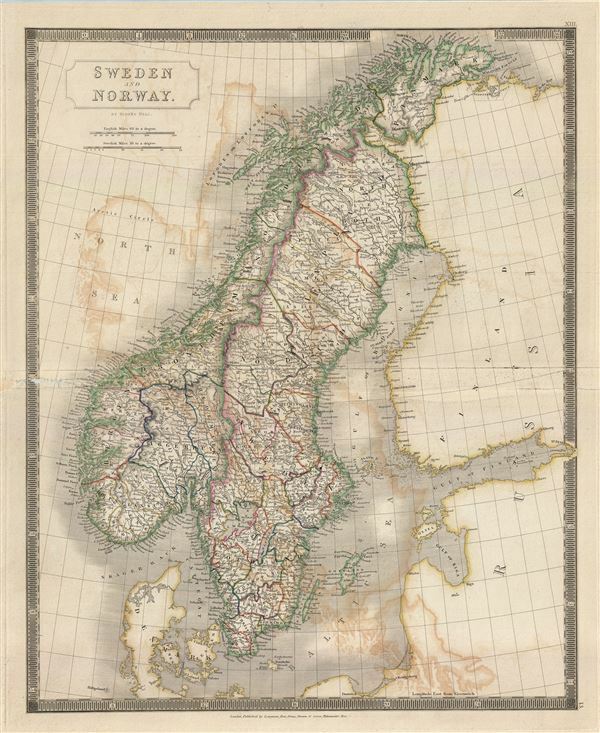 This is a beautiful map of Sweden and Norway from Sidney Hall's extremely scarce 1835 New General Atlas. It covers from the Arctic Sea south to Denmark and east as far as the Gulf of Finland. Towns, rivers, mountains, railroads, and various other important topographical details are noted. Elevation throughout is rendered by hachure and political and territorial boundaries are outlined in color. Hall even notes legendary and semi-mythical whirlpool known as the Loften Maelstrom (Malstrom), made famous by Poe's short story, in northwestern Norway. The 'Disputed District' near the Waranger Gulf and Finmark, now Sor-Varanger, was until 1826 a common Norwegian -Russian district important to the fur trade. It was subsequently divided, with some contention, between Norway and Russia. As this map was being printed, all of Scandinavia was in the midst of a prolonged period of peace and prosperity that led to a cultural and population boom. Good. Visible damage and verso repair along original centerfold, especially near left center margin. Original platemark visible. Backed with archival tissue. Some offsetting. Rumsey 4224.013 (1830 edition). Philips (Atlases) 758. Ristow, W., American Maps and Mapmakers: Commercial Cartography in the Nineteenth Century, p. 303-09.